With each browser update, full ES6 support has been getting closer and closer. But this is still sometime away, and transpilers like traceur or 6to5 can help bridge the gap in some areas. One ES6 functionality I am very much interested in, is module. As of today, no browser natively supports this, and I would have to transpile my code to get this functionality.So, I once again would like to use my favorite module loader, requirejs for doing this. 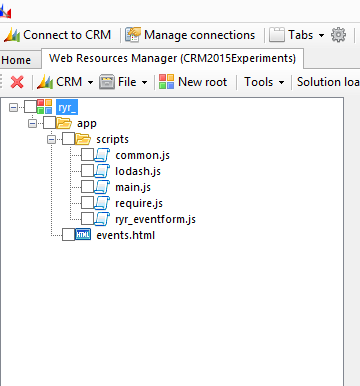 The last time I did this (https://dreamingincrm.com/2014/04/15/using-requirejs-in-crm2013/) I had to use some unsupported tricks to get this working in CRM2013. This time, my approach is to do away with CRM script loading mechanism altogether and use requirejs to load the form scripts. Here is how my resources are organised. main.js is the entry point into the form processing code. 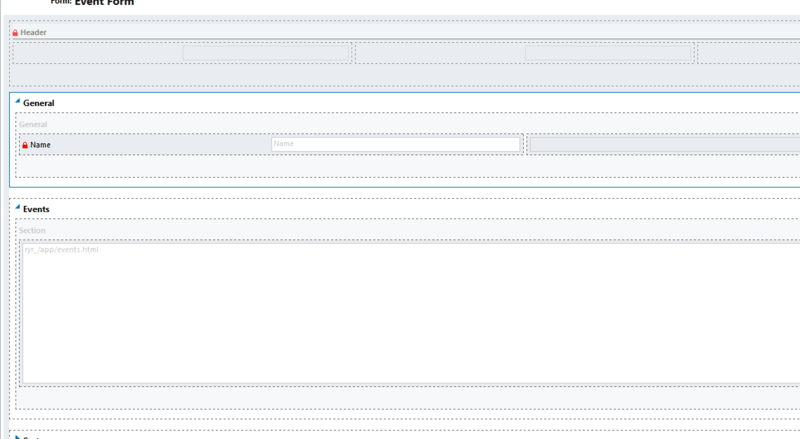 I am loading the scripts using requirejs, but the triggering page is an external web resource. This way I can keep this a supported method. This is common.js, which is required by ryr_eventform.js. Here is how the form looks in the design mode. I have not added any scripts to the form. Since requirejs will start loading the scripts, you don’t need to worry about this. 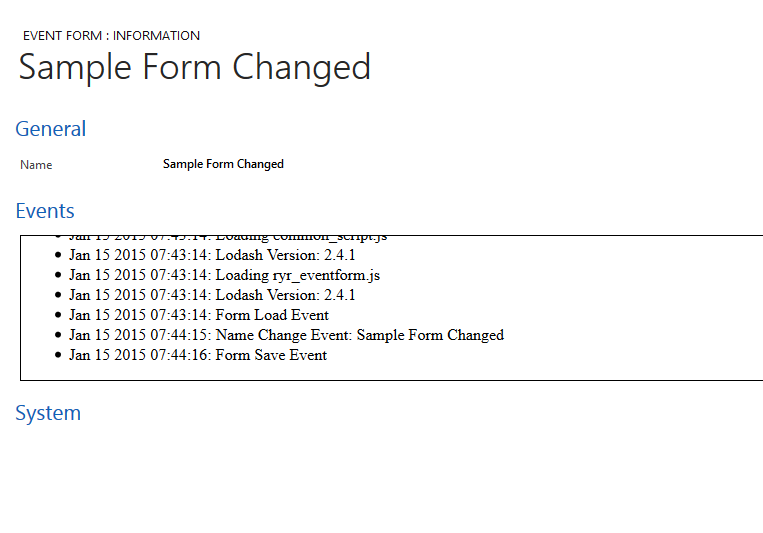 Lets start looking at some form events now and how the script behaves. 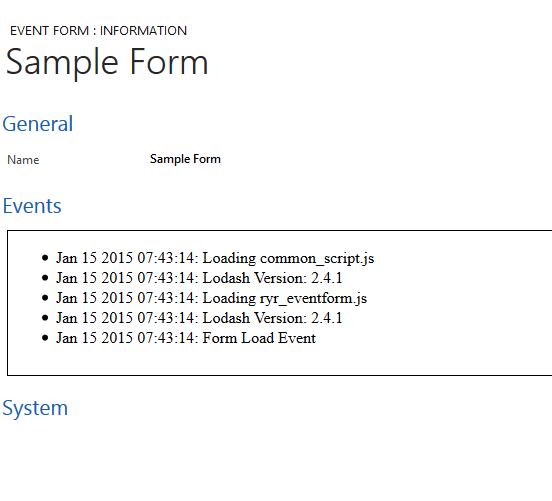 As you, can see a script can do exactly the same things, even though it has not been been loaded through the CRM form script loading mechanism. These are are two key things that help to achieve this. The impetus for this post is this: I have got “The form has changed. Would you like to save your changes” dialog more than a few times and I have no idea what is the reason for this dialog. If the change has made by a script, I have no way of knowing what the change was, and which script triggered this, unless I have added some console.log message the scripts. This is not possible if I can’t change the script. You could live edit the script using the DevTools, but I don’t want to do that. If CRM Client API exposes some sort of event listening capability, this would help the devs to listen to certain events like form save, form load, field onchange from the devtools console and figure out what is happening with the form, without using the debugger step through. 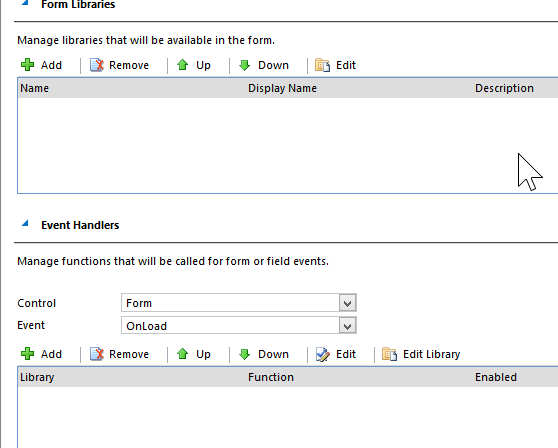 CRM itself, uses custom events and listeners internally, to figure out what scripts to execute for a particular event. But this functionality is not exposed externally for everyone to use. Until this is made available down the line, into some sort of Client API – Dev Mode, I can use this to control the form script loading process and audit of form events. I prefer loading the modules at runtime ondemand, but directly referencing requirejs using the standard form scripts functionality is still hacky. The Iframe technique referred in this post works, but it uses “parent.” to reference the global Xrm object. I don’t think this is a problem, but I haven’t tested the form behaviour in the mobile app, as the scripts are loaded in the custom IFrame context and not inside the ClientApiWrapper IFrame. The ghost form script that merges the dependencies on demand – I did this as a proof of concept and not using in production. I have used these two techniques: requirejs with on demand module loading and browserify to merge all dependencies into one script. The requirejs is minimal effort in terms of setting everything up, but I spent days to get the initial setup right, with the gulp+tsc+browserify route.